Does your current floor plan leave you aching for more counter space? Does your home plan lack the space for the high-end appliances and large island that you crave? Never have a kitchen catastrophe again by checking out these house plans with fabulous kitchens! Each of these fabulous kitchens give plenty of counter space, layouts that accommodate luxury appliances, and an incredible amount of storage. Take a look, get lost in your dream kitchen, and then build it into reality! And remember, hundreds of house plans with fabulous kitchens await you at TheHouseDesigners.com! 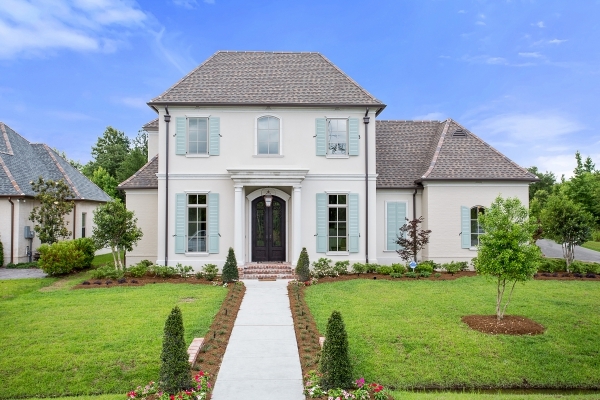 House Plan 9627 is a beautiful home with sophisticated European charm. This large, two-story home has a beautifully open concept main floor. The master bedroom has you living in the lap of luxury with its incredible walk-in shower! Spread out and enjoy some elbow room with two master bathroom vanities with individual storage areas as well. A second bedroom is also found on the main floor, with included en-suite, perfect for spoiling your guests. Two additional bedrooms and a full bath are found upstairs, atop the grand staircase in the home’s entryway. You’ll never feel left out of the party while in this chef’s kitchen! Because it is so open and spacious, with clear views of the entire living space, you’ll be the perfect host of any gathering. The large oven and cupboard surround allow you to cook in style. So much character is added to the space with this feature! Two sinks and endless storage space go along with over-sized appliances to make this one of our most fabulous kitchens! House Plan 9215 is a beautiful Craftsman-style home with just under 3,000 square feet of living space. A split-bedroom floor plan gives the master its needed privacy. Even more importantly, an incredible master closet connects directly to the laundry room with plenty of space for storage. An office just outside the master bedroom is perfect for a day of working from home, or getting some reading done. This home is great for entertaining because of its open-concept interior and inviting outdoor spaces off of both the great room and dining area. 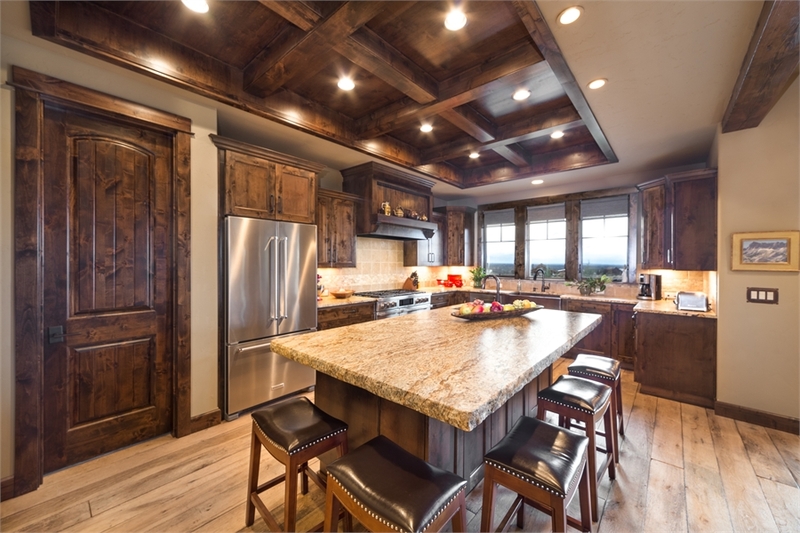 Are the holidays leaving you cramped in your current kitchen? 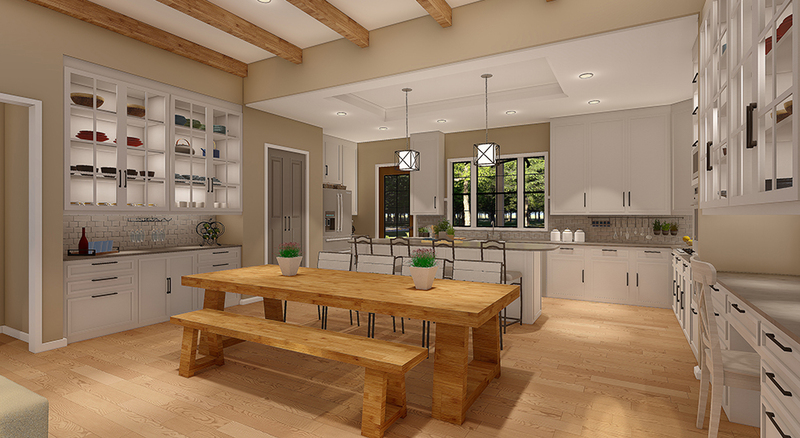 In your new build, you could enjoy the fabulous kitchen inside of House Plan 9215. Somehow elegant and still homey, this kitchen boasts a kitchen the family chef will love to cook in! Family will gather around the large island with snack bar seating, chatting and enjoying the show while meals are prepared in style. There are also double sinks, one in-island and another looking out over the front yard. With this kitchen, even clean up can be a breeze! 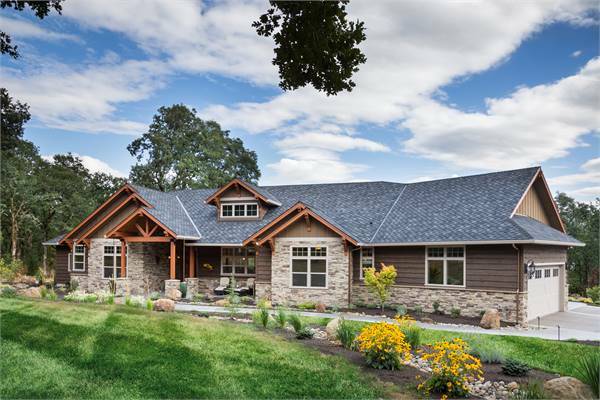 House Plan 6967 is an entertainer’s dream! This home’s floor plan is completely open concept. The kitchen, dining, and living space flow seamlessly together. If that isn’t enough, this mid-sized home boasts three bedrooms and a designated laundry space near the master. The master suite itself is a lovely getaway. Special window seating invites you to sip coffee or read. The master’s en-suite includes a double vanity, large tub space and separate walk-in shower, toilet closet, and a spacious walk-in closet. 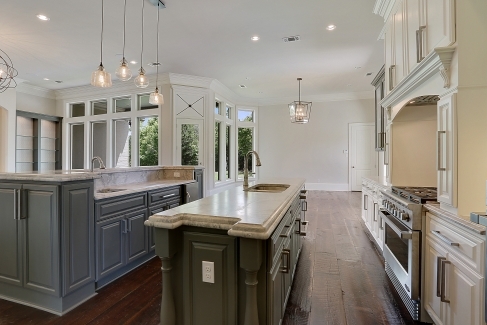 This incredible kitchen boasts a large island, allowing plenty of room for family and friends to gather. How about an outdoor cooking and entertaining space to go along with a perfect entertainer’s floor plan? Easily accessed from the kitchen and main living space, this beautiful outdoor kitchen brings your back yard space to life, and keeps you where the party’s at! Not to mention, there is incredible storage and counter space in both fabulous kitchens! 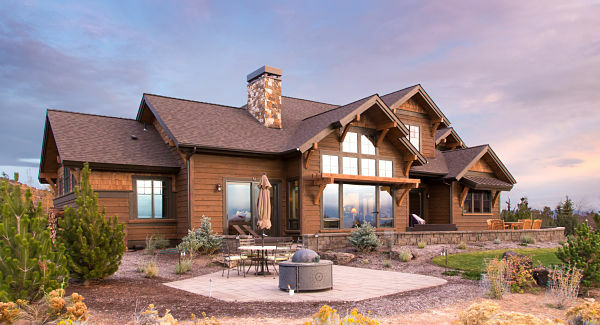 Nearly 4,000 square feet of luxury can be found in House Plan 1497. This home gives everyone in the family their space with three spacious master suites. A large mudroom off of the garage also acts as the home’s laundry room, helping to cut clutter and keep your family well organized. Enjoy a gorgeous fireplace feature in the home’s main living space as well as beautiful beamwork overhead. A den on the main floor and a large bonus space upstairs mean that you will never lack for space with this wonderful home plan. 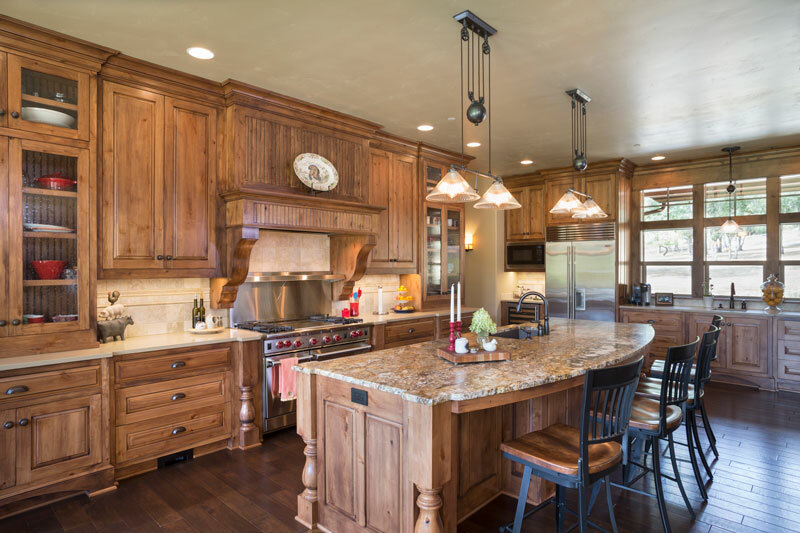 This home’s kitchen leaves nothing to be desired with its expansive counter space enhanced by a large island. Never lack for storage space with a generous walk-in pantry and tons of cupboard space. Cook with ease, comfort, and a touch of class, because there is more than enough space for large and impressive appliances in this kitchen. At the end of a great meal, don’t be the only one to clean up! Tidying the place is easy with two easily accessible sink stations. Please enjoy even more of our homes with fabulous kitchens! Also, take the time to browse our affordable house plans, or small house plans. We have great homes for everybody!